In 1914 the United States completed the Panama Canal, where Lesseps, the great pioneer of the Suez Canal, had failed tragically. One of the shortest ways from the USA to Panama had been by steamer from New Orleans. 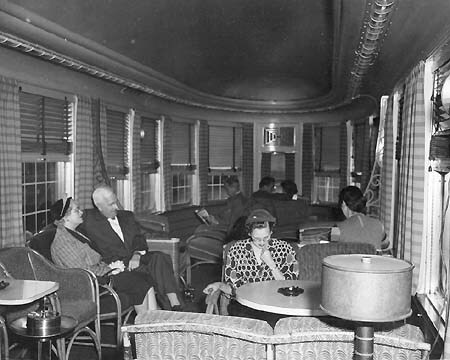 And the de-Luxe from Chicago to that romantic place was the Panama Limited of the Illinois Central. 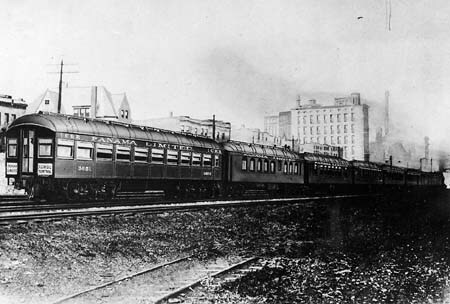 In 1911 the Chicago & New Orleans Limited had got that name in honor of the work at the Panama Canal. Its Brooks Pacifics hauled wooden Pullman sleeping-cars Chicago- and St. Louis - New Orleans as well as sleepers destined for Hot Springs, San Antonio and San Francisco via Southern Pacific, and south of Memphis also coaches. 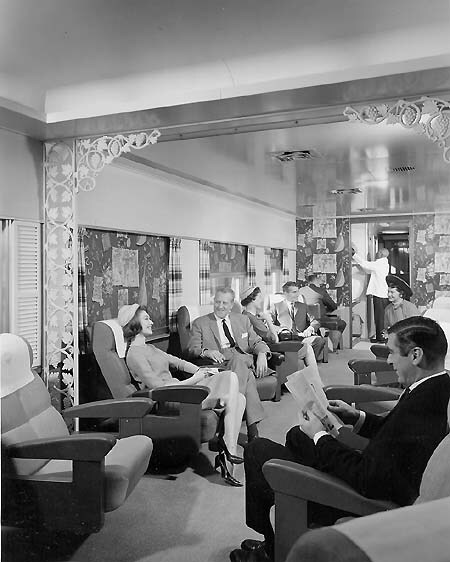 Soon came all-steel Pullmans with parlor-observation car, arched roof and other Pullman 12-wheelers, including a men's buffet car with barber shop. In 1932, sadly, the exclusive train was interrupted for 2 ½ years. Then it re-appeared, on the first run hauled by the Alco Mountain engine 2411, brightly decorated. 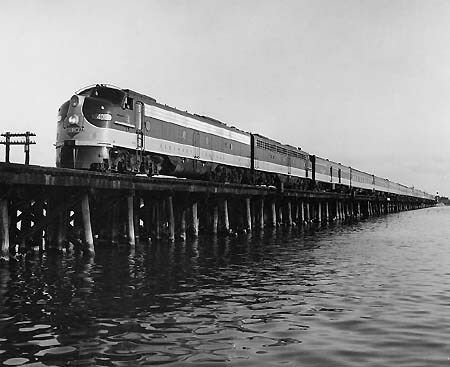 In 1942 it became a streamliner, headed by the GM/EMD E6, then bulldog-nosed E. In the new twin diner unit the "King's Dinner" was served with cocktail, fresh shrimp or crab, fish course, broiled steak accompanied by imported wine, apple pie and coffee, as Arthur D. Dubin reported. Still in the early '60s the Panama Limited had been one of the three last all-sleeper Pullman trains in the USA. When it was replaced by an Amtrak heritage train set, finally renamed City of New Orleans, the gentlemen of the Illinois Central regretted deeply the disappearance of this once proudest train and its noble clientele. Nevertheless, with Superliner cars it’s a nice train. 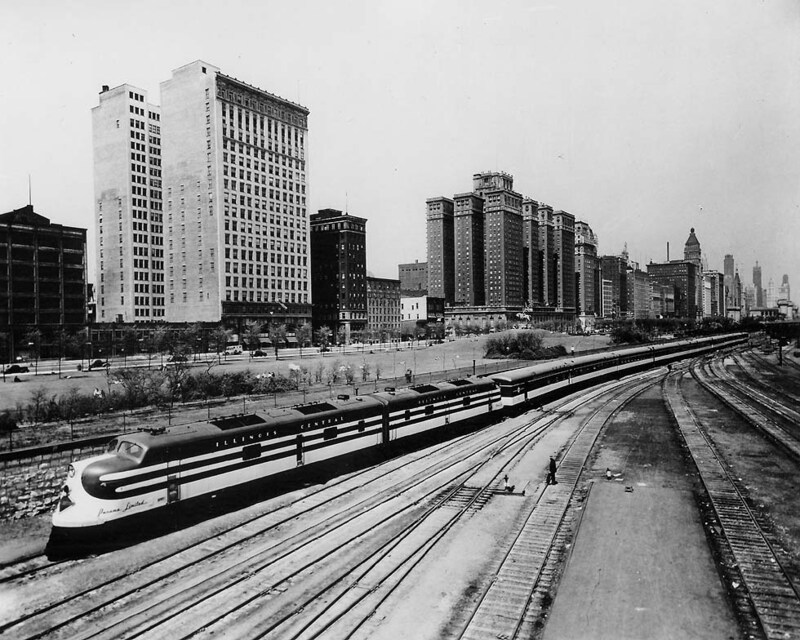 1856: Illinois Central Railroad Chicago - Cairo completed, connecting with Blue Line steamers to New Orleans. 1873: Trains Chicago - New Orleans, ferried across the Ohio River until completion of the bridge in 1889. 1911: The Chicago & New Orleans Limited was renamed Panama Limited. 1942: Panama Limited an all-sleeper streamliner. 1971: Amtrak saved passenger train services, Panama Limited later renamed City of New Orleans, including coaches. 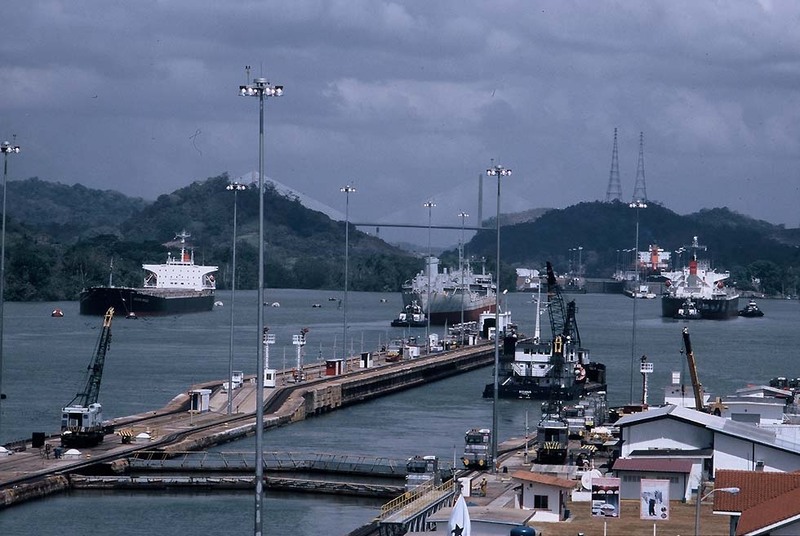 The Panama Canal had become a vision for France after the successful completion of the Suez Canal in 1869. 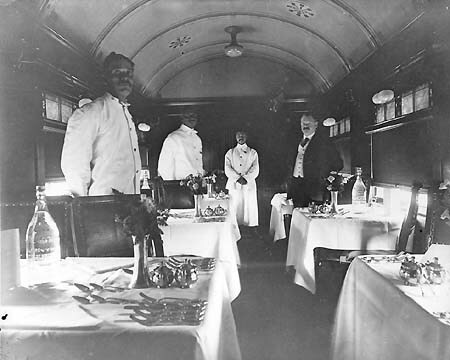 Two decades before however, Cornelius Vanderbilt (later the tycoon of the New York Central) organized a route from the Caribbean to the Pacific by boats and stage coaches crossing Nicaragua. 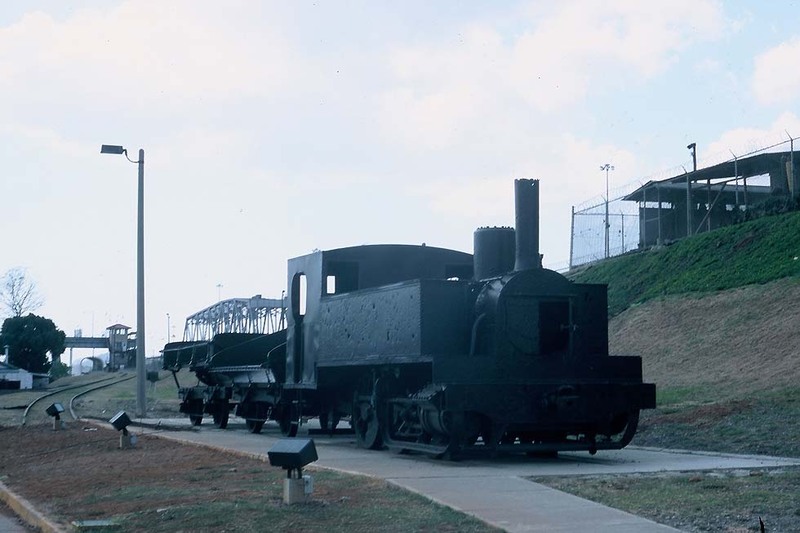 From 1855 the mainly American-owned Panama Rail Road Company from Colon (initially Aspinwall) to Panama Balboa Terminal connected the Oceans on 1.524m broad gauge. Between 1866 and 1868 the British mail for New Zealand took that way, only during two years however. Panama at that time was a part of unreliable Colombia. 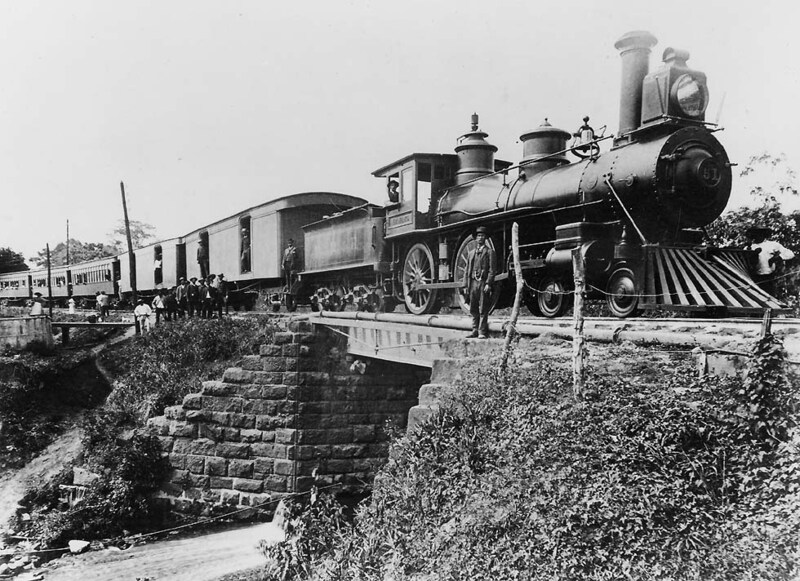 After completion of the rail link between the east of the USA and California in 1869, the Panama Rail Road essentially was bankrupt. Preparing to build the canal, the French bought the railway in 1879. A picture taken around 1884 shows an American 4-4-0 type locomotive hauling wooden bogie coaches with open platforms. In 1880 French work on the canal started, but it was a task too great for that time. The United States under President Theodore Roosevelt completed it between 1904 and 1914 after Panama had come under American rule. The railroad was rerouted during the construction works and it continued services. Even after WWII 2-6-0 steam locomotives hauled grimy green coaches between Panama, the old station, and Colon. Then road switcher type diesels from Alco appeared with green/gray/light-blue trains. 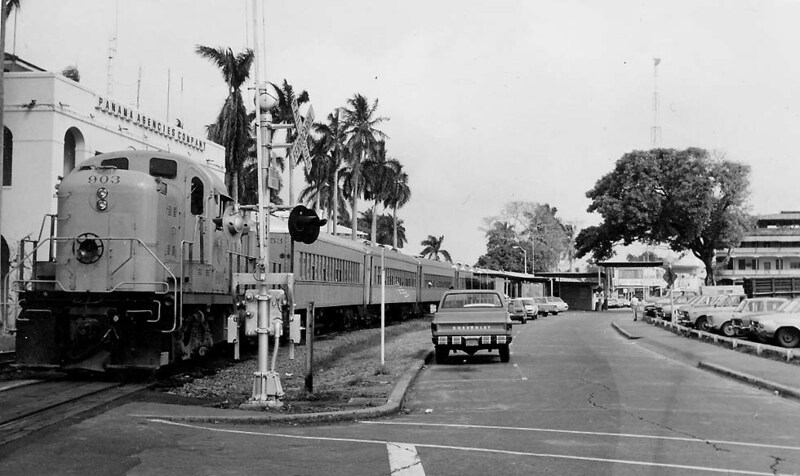 In 1977 the government took over the railway, but around 1993 services on that broad-gauge Ferrocarril de Panama were interrupted. 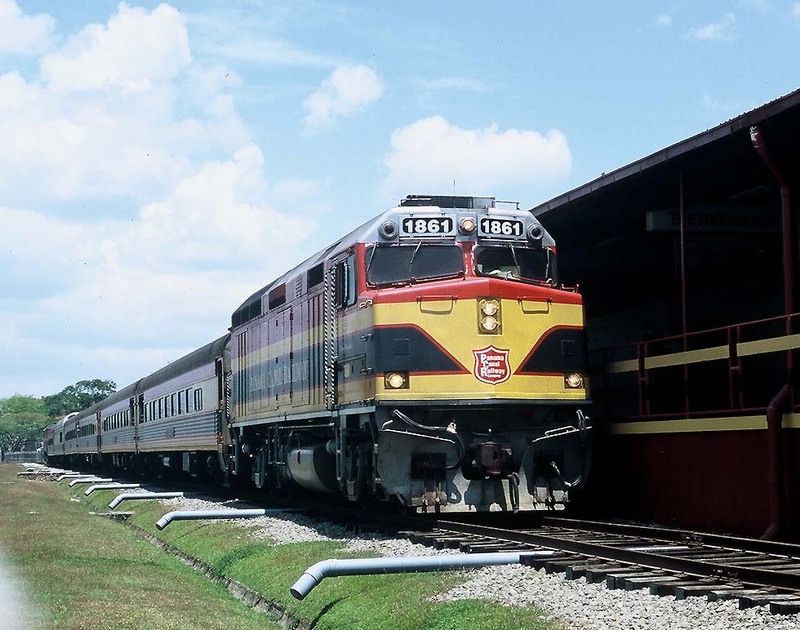 The line became rebuilt and in 2001 the new Panama Canal Railway Co. started passenger services between Panama Corozal and Colon with American rolling stock on standard gauge. Though main purpose of the railway is container transport, even prestigious special trains may appear, mainly for passengers of Princess Cruises. 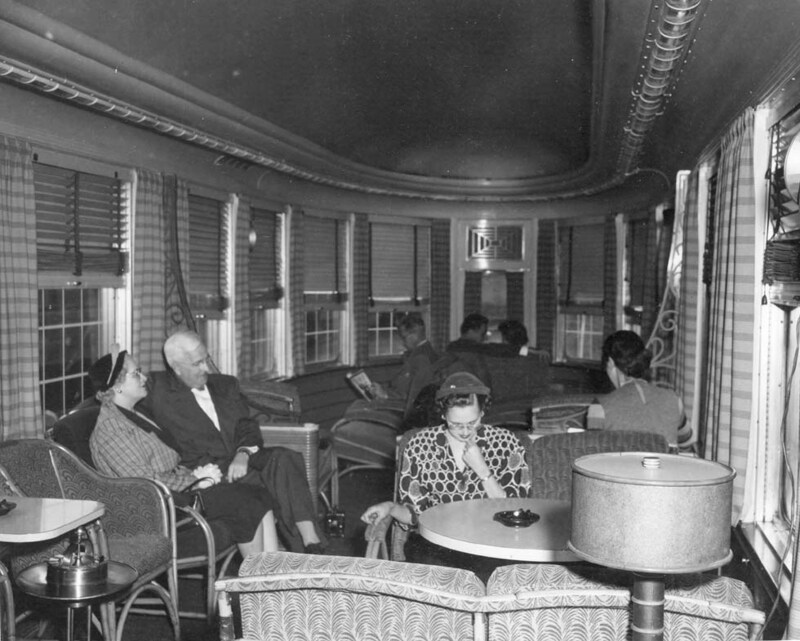 For that purpose five coaches were luxuriously refurbished and a full-length dome-car, ex-Southern Pacific “Rio Chagres”, was added. On March 14, 2006 such a consist made a sightseeing trip for passengers of world’s most famous cruise ship, the “Queen Mary 2” on a tour from California to New York via the Cape Horn, for the QM2 is “post-panamax”, too big for the canal until a further improvement. Diesel Panama Canal Railway Co. The kind help by Panama tourist guide and taxi owner Eric Rodriguez (32@hotmail.com) is appreciated.